The first 20’ WAM-V has been delivered to TeamTao, a finalist in the Shell Ocean Discovery XPrize competition. 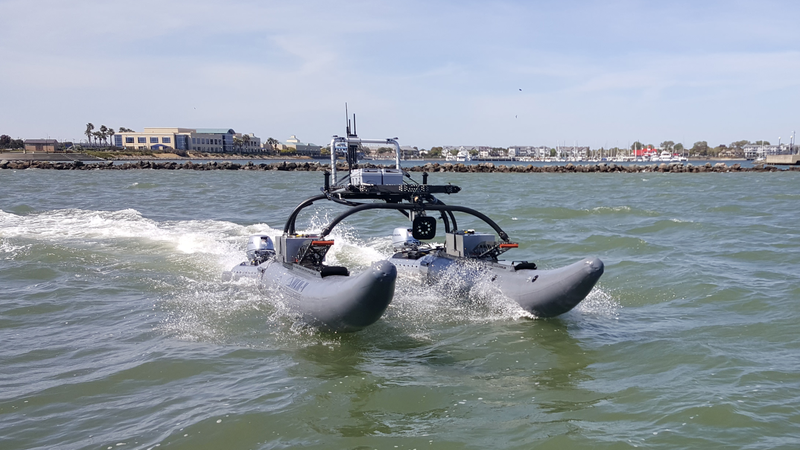 The new WAM-V has a range of over 400 nautical miles, can carry up to 600 lbs of payload, has a top speed of 15+ knots, and has passed rigorous open-ocean testing to ensure it is a stable platform for sensor deployment. The 20’ WAM-V ASV will be used by TeamTao to launch and retrieve a swarm of undersea drones capable of mapping the ocean floor at a depth of 4km. Marine Advanced Research is planning a production run of 20’ WAM-Vs configured for hydrographic survey and oceanography, starting in 2019. The WAM-V is an innovative class of watercraft from 8’ to 150’ that can be tasked with port surveillance and security, UAV & UUV deployment and retrieval, MCM (Mine Countermeasures), nodal communications, benthic operations survey, maritime interdiction, and offshore oil and gas operations.